Women Beyond Borders has been a resource for teachers since it’s inception. Teachers from elementary school all the way through higher education have adapted the project in various ways. 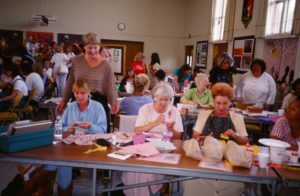 A variety of educational programs were conceived this way: such as workshops for schools, universities, museums, libraries, as well as women’s and girls’ organizations. Below are examples of these WBB educational arts programs and a sample lesson plan. At the Getty Education Institute for the Arts and Southern California Institute for Visual Arts, Los Angeles, Lorraine Serena and Beverly Decker conducted a workshop for a total of 185 participants from El Segundo and Santa Barbara. A video created by Jody Nelson about the Girls Inc. Box Project in Santa Barbara, California. 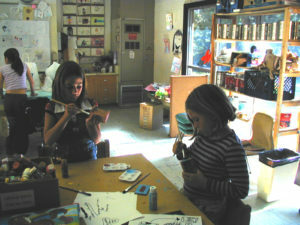 Girls Inc. collaborated with Women Beyond Borders to create boxes for WBB’s ten-year retrospective in 2002 which took place at the University Art Museum in University of California Santa Barbara. SEE MORE ABOUT GIRLS INC.
Building Blocks was an adjunct project initiated by Diep Vuong and the Pacific Links Foundation and funded by the Consular Club of Ho Chi Minh City in Vietnam to support the reintegration process of survivors of human trafficking. A three-day intensive box project was held in Mui Ne, a local beach town that allowed the young women from PALS’ Southern Shelter to distance themselves from their current environment and gain perspective and reflect. 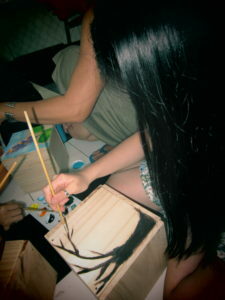 This project focused on helping trafficked returnees rebuild their lives through art. Through creative arts workshops, as well as individual and small group sessions, the project focused on building healthy self-esteem and healthy relationships. 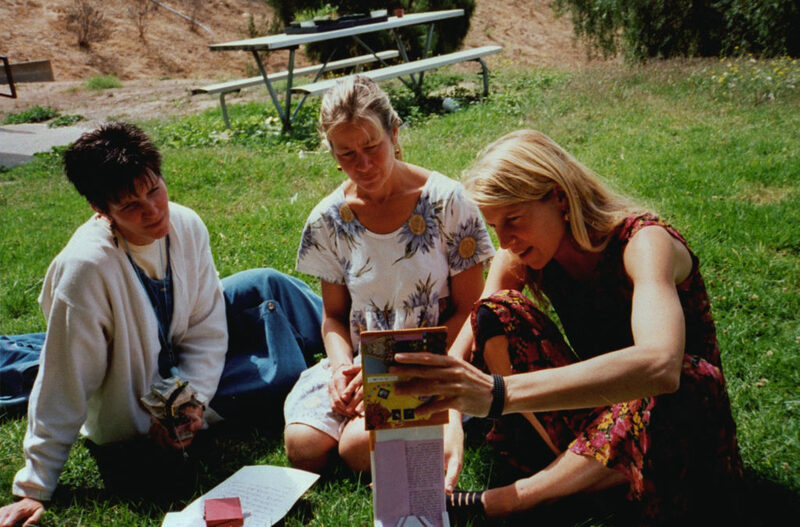 The young girls worked together to build wooden boxes, paint them, and assemble them into a collaborative mosaic, symbolizing the individuality of each woman and the interconnectedness of their journeys together, to rebuild a new life. Boxes were created in collaboration with Ruth Lubbers and Very Special Arts, DC. Fifty cardboard boxes were sent to each of the 135 affiliates of VSA around the world and over 6,000 children with special needs participated. Each affiliate had their own exhibition and a selection of boxes were exhibited along with the WBB exhibition, at the 2002 Cultural Olympiad in Salt Lake City.